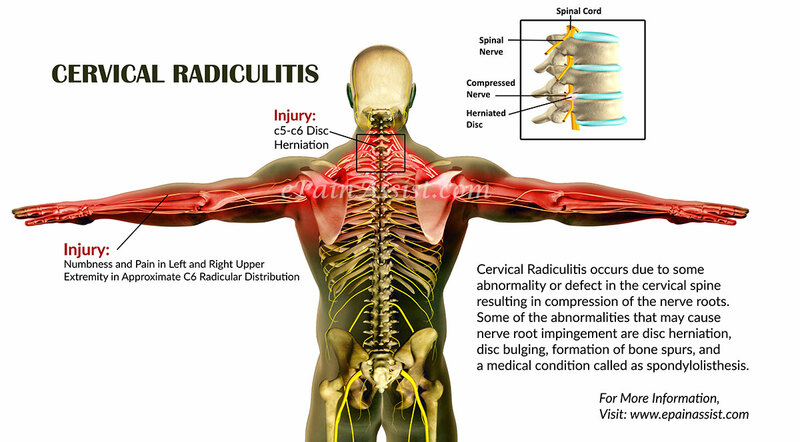 Cervical radiculitis is when there is damage to the nerve roots of the cervical spine (C4 to T1) causing pain and loss of sensation or muscle weakness or numbness along the pathway of the peculiar nerve into the shoulder or arm or hand or chest depending on which nerve root pathway is involved. These pathways are also called dermatomes; see below. Damage to cervical nerve roots occasionally due to some abnormality or defect in the cervical spine resulting in compression of the nerve roots. Some of the abnormalities that cause nerve root impingement at the vertebrae level are disc herniation, disc bulging , formation of bone spurs and a condition called spondylolisthesis where one vertebra slips forward onto the below vertebra. Other causes of disc/nerve root compression may be persistent subluxation of vertebrae or fixation of a group of vertebra. These can be a result of poor posture or an injury such as head trauma or whiplash. 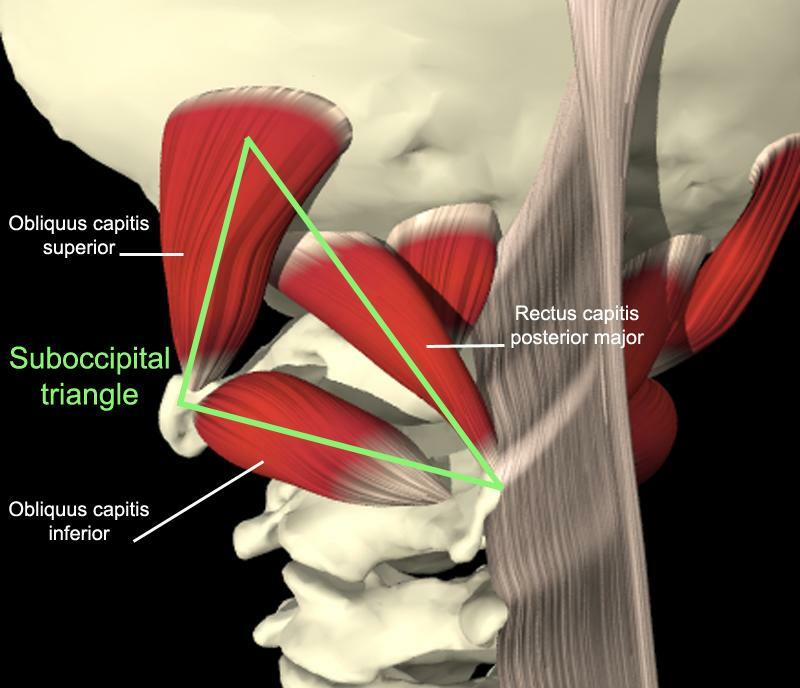 Adding to these problems is the imbalance of surrounding musclature ; for example it is common to find the relationship between the neck flexors and neck extentors to be completely dysfunctional. After the orthopedic & neurological tests to find if there is disc compression and which nerve root pathway (dermatone) is affected, a testing of neck, shoulder,chest and arm muscles is d one. Are there weak muscles?. Is there a relationship between these weak muscles and other muscles that may be overworking. Are there muscles that need to be “turned off” and others need to be actiovated; I can use muscle spindles & golgi tendons to do this. .
Neuro-lymphatic and neuro-vascular pints are worked on to increase lymph and blood flow to affected muscles. Any bilaterally weak muscles would point to fixation of 2 or more vertebra and need to be corrected accordingly . The patient is given stretches for the overactive muscles and exercises for the weak muscles , posture esp head position is reviewed. One of the major complaints that causes patients to seek out a doctor of chiropractic is low back pain; it can be caused by either a problem with the lumbar spine or the sacrum. 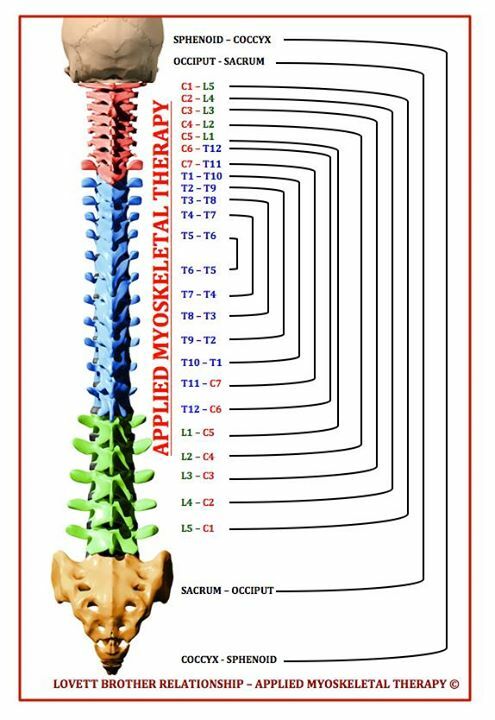 As a doctor of chiropractic who is also an applied kinesiologist, I use a technique developed by Dr. DeJarnette called Sacro Occipital Technique (SOT); so named because of the relationship between the sacrum (base of the spine) and the occiput (base of the skull). 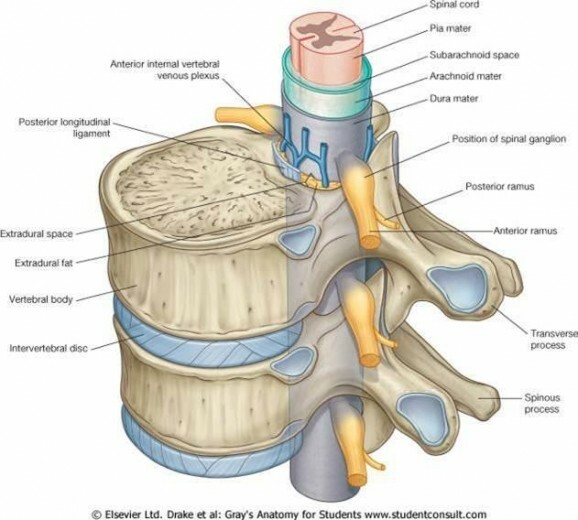 One of the functions of the sacrum is to pump cerebro-spinal fluid (CSF) from the base of the spine back up the spinal canal to the brain and throughout the nervous system. The occiput also helps to pump CSF. The minute rhythmical motion is essential to optimal health – CSF effectively acts as the circulatory system of the brain and spinal cord. The pelvis forms the foundational support of the human skeleton. It supports the upper body right up to the skull, and enables us to transfer our weight to our legs. The sacrum is a large bone located at the terminal part of the vertebral spine, where it forms the posterior aspect of the pelvis. The spine holds our body upright, supports all of our organs and provides anchor points for our muscles. It also protects our delicate nervous system. The nervous system controls our body, and can only function normally when our structures are balanced and our pelvis, sacrum and lumbar is stable. Dr. DeJarnette’s studied two aspects of the sacroiliac joint; the anterior synovial portion and the posterior hyaline cartilage portion. The anterior sacroiliac joint should have motion and this is where sacral nutation and counternutation takes place. The posterior sacroiliac joint is focused on weight-bearing stability and support, which is why at the posterior joint surface there are interlocking of the ridges, and grooves by structures like muscles, ligaments and fascia. DeJarnette evaluated the weight-bearing characteristics of the sacroiliac joint and determined that when the joint could not adequately support body weight then load bearing stress will be moved upward to the L5/S1 and L4/5 discs, most commonly. DeJarnette developed an analysis which classified pelvic problems into three different categories and three different non-force techniques using SOT blocks in positions that correct the involved category. Dr. DeJarnette’s studied two aspects of the sacroiliac joint; the anterior synovial portion and the posterior hyaline cartilage portion. The anterior sacroiliac joint should have motion and this is where sacral nutation and counternutation takes place. The posterior sacroiliac joint is focused on weight-bearing stability and support, which is why at the posterior joint surface there are interlocking of the ridges, and grooves by structures like muscles, ligaments and fascia. Category One is a pelvic torsion with altered sacral nutation(motion) This lack of nutation affects the spinal and cranial meningeal and CSF systems which function to a degree like a closed kinematic chain. Therefore symptoms can be low back pain, chronic shoulder complaints, thoracic outlet syndrome, CSF stagnation, and altered vasomotor function. Involved muscles can be the piriformis, quadratus lumborum, sacrospinalis, gluteus medius and gluteus maximus. As an applied kinesiologist, I’d check to see if they are hypotonic or hypertonic; as a neurokinetic therapist, I’d check to see if a muscle is weak (or inhibited) by another muscle compensating. Therapy localization (TL) is done by putting 2 hands on each sacral-iliac joint and then challenging the pelvis for a structural listing and then blocks are put under the patient’s pelvis based to the findings. The positive Tl’ed side is not adjusted. Cranials are checked. Category Two happens when ligaments that hold the sacroiliac joint are stretched or sprained, allowing the joint surfaces to separate. Stress can aggravate this ligament weakness via adrenal hormone overdrive. Symptoms can be low back pain, bowel complaints, possible dysfunction of the reproductive glands and the adrenals, shoulder problems and decreased cervical range of motion. Involved muscles in addition to the ones mentioned in Category I are the sartorius, gracilis, rectus abdominals and hamstrings along with the iliolumbar ligament. These structures are tested via applied kinesiology and neurokinetic protocols mentioned above. Cranials again are checked. Category Three occurs when the low back can no longer tolerate the physical stressors placed on it and involves both disc and nerve root aggravation. This can be a sudden one-off event such as a lift, or it can be a pre-existing weakness that is aggravated. Often Category Three produces pain in the low back and sometimes pain radiates down a leg as sciatica. Muscles to be checked are the psoas as it attaches into the front of the lumbar vertebrae as well as the muscles involved in Category One as Category Three can be a Category One that was never corrected. Correction in all the categories involves using blocks under the pelvis in specific directions related to the category and the subluxation/misalignment of the pelvis/sacrum. The patient’s weight and breathing help to balance the low back, sacrum and CSF flow and takes the pressure or irritation off the nerve. This allows the body to heal. Patient is told to ice the involved areas, how to do daily activities, given stretches and exercises and advised on nutrition to help the body heal. They may have been told that their problem is sciatica since branches of the sciatic nerve goes all way down the leg and into the toes. They may have been to a physical therapist or another chiropractor who worked on the low back where the sciatic nerve originates without any relief. But the problem is the peroneal nerve which branches off the sciatic just below the knee; it goes from the common peroneal nerve which starts at the lateral back of the knee near the inner side of the biceps femoris (part of the hamstings), goes to the back of the fibula bone and then branches off to the superficial peroneal nerve and the deep peroneal nerve. The deep peroneal nerve innervates the muscles of the anterior compartment of the leg which are: tibialis anterior, extensor hallucis longus, extensor digitorum longus, and the peroneus tertius. 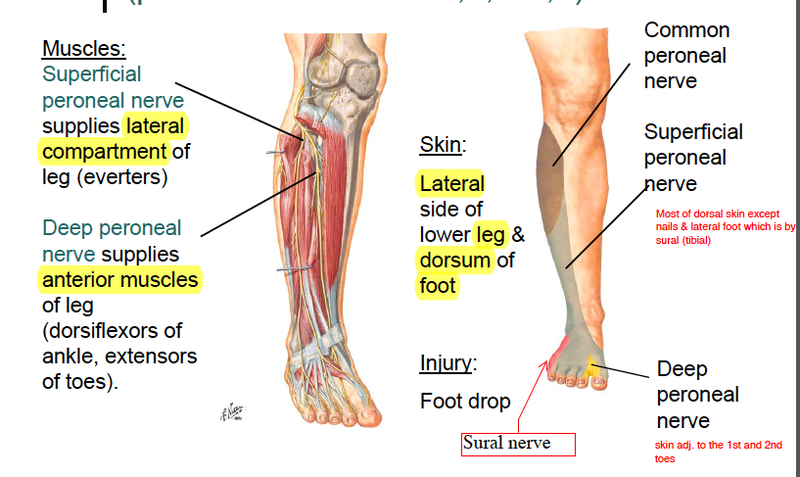 Together these muscles are responsible for dorsiflexion of the foot and extension of the toes. The superficial peroneal nerve passes between the peroneus muscles and the extensor digitorum longus, and goes into the deep fascia at the lower third of the leg; it supplies the muscles of the lateral compartment of the lower leg : peroneus longus and peroneus brevis. These assist with eversion and plantar flexion of the foot. The deep peroneal nerve passes inferior and medially, deep to extensor digitorum longus, and comes into relation with the anterior tibial artery above the middle of the leg; it then descends with the artery to the front of the ankle-joint, where it divides into a lateral and a medial branch. The deep peroneal nerve innervates the muscles of the anterior compartment of the leg which are: tibialis anterior, extensor hallucis longus, extensor digitorum longus, and the peroneus tertius. 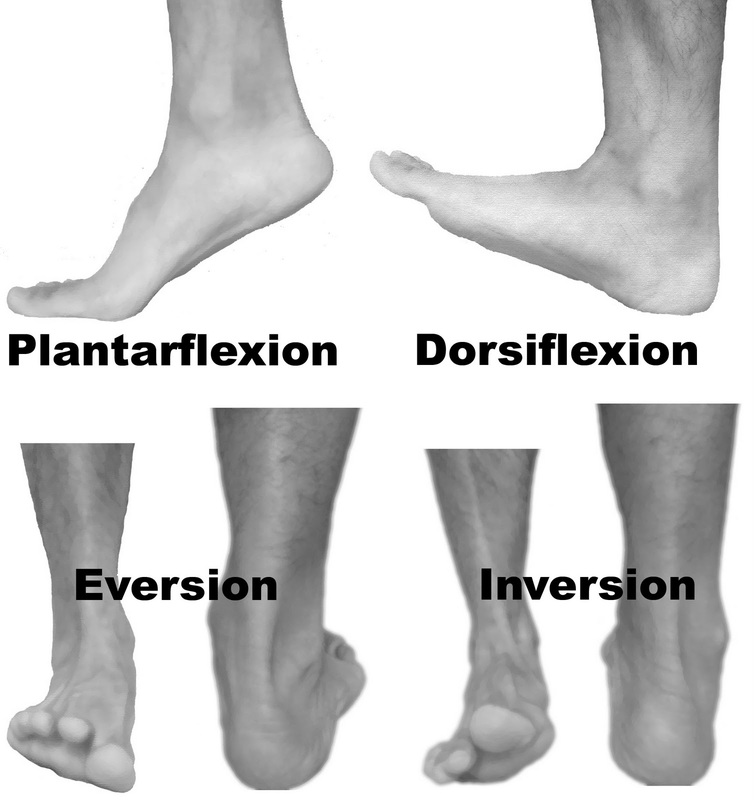 These muscles are responsible for dorsiflexion of the foot and extension of the toes. Spasms of muscles along the route of these nerves can cause nerve entrapment and result in loss of muscle function or pain along the route of the nerves. As muscle attaches to bones and joints, spasms can cause misalignments of these structures and this can further complicate the problem. Sometimes the muscle spasms are complicating for a muscle that is inhibited somewhere along the lateral or posterior kinetic chain such as the gluteus maximus, gluteus medius, the hamstrings and the rectus femoris or the psoas which overwork in order to to lift the leg to clear the dropped foot during walking. Neurokinetic therapy works well answering this question and correcting the problem. As a applied kinesiologist and neurokinetic therapist I will either place my finger or hand on specific areas and then retests the muscle to see if the weakness is corrected. This is called therapy localization. If the therapy localization is positive and the area involved is a joint or a muscle, I can move the area in a way to stimulate neuro/mechano receptors in the joint or muscle. This is called a “challenge’ and shows the direction of manipulation needed to improve function of the joint or muscle. As a chiropractor, I would not only adjust the involved joints but check to see if the change in gait muscles has affected the spine and adjust affected level. Stretches are given to the previously complicating muscles and exercises given to the previously inhibited muscles in order to break the pattern that caused the problem. Every few times during the year, I get a patient with a displaced rib head. (I’ve had one or two myself) The sensation is an intense stabbing pain that “takes your breath away” in either the back or the front of the chest; sometimes the pain goes round the rib and sometimes seems to go from the back to the front like a knife. When a patient comes in, we evaluate them via examination and a detailed history to rule out things like shingles or referred pain for heart, lung and gastrointestinal problems. A lot of the times, the patient has already been evaluated by their M.D. for these conditions with negative results. But it’s usually a rib head displactment either at the anterior attachment at the sterum [breastbone] or at the posterior attachment at the transverse process of a thoracic vertebrae. 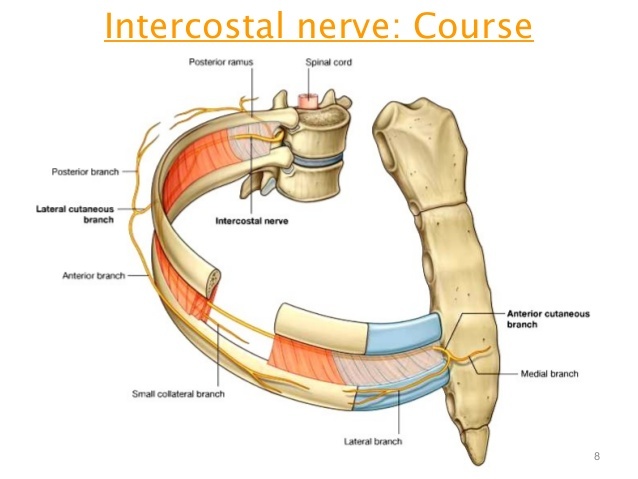 The intercostal nerve runs from the anterior rami of the thoracic spinal nerves from T1 to T11 and runs [along with the artery and vein] between the intercostal muscles to the breastbone. Of course it’s not surprising that a rib displacement “takes yr breath away” as the ribs (& the clavicle) and a lot of the muscles attached to them are involved in inspiration and expiration. 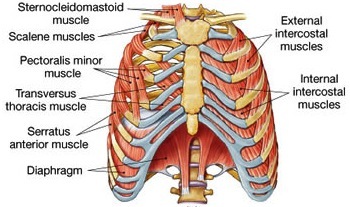 Some of these muscles are the diaphragm, the external & internal intercostals, the serratus anticus, pectoralia minor, scalene & SCM muscles. 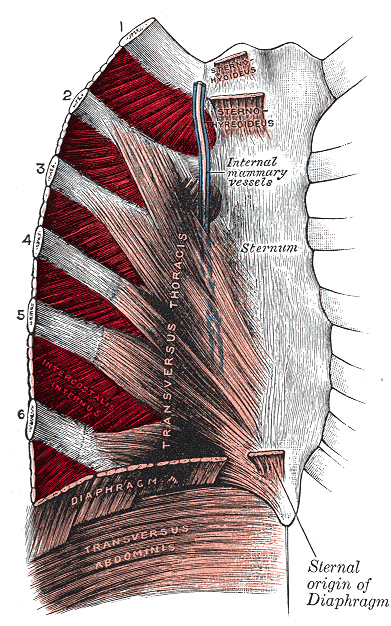 Muscles attached to the ribs or thoracic spine which may not be directly involved in breathing but may be compensating for a problem with the breathing muscles. Some of these muscles are the rectus abdominis, the abdominal oblique muscles, the psoas, the quadratus lumborum, the rhomboids and latissimus dorsi; they may be on the same or contralateral side to the displaced rib. Before I adjust any displacement of the ribs involved or the breastbone or the clavicle as a doctor of chiropractic; I need to balance the muscle pull on the affected area. I use the muscle testing used in both Applied Kinesiology and NeuroKinetic therapy. As a Applied Kinesiologist, I test for the function of individual muscles. The questions to be asked are: why is the muscle weak? Is the muscle on the other side hypertonic or “too stronger.” Is the weakness due to a spinal/nerve problem, a vascular problem, a problem with lymphatic function, a nutritional default, a problem with organ function or an acupoint associated w/ that muscle? As a NKT practitioner, I ask “Is there a dysfunction in the coordination of muscles working in patterns?” NeuroKinetic Therapy works with that concept that movement is performed in systems or patterns. NKT identifies muscle imbalances by using muscle testing to determine what muscles are inhibited and what muscles are compensating (facilitating) for them. Once the above muscle related questions are answered, I can adjust the involved rib, clavicle or spinal segment. Stretches are given to the previously facilitated (or hypertonic) muscles and exercises given to the previously inhibited (or weak/hypotonic) muscles in order to break the pattern that caused the problem. When a patient complains of neck pain or headaches, I first muscle test both the cervical flexor and extension muscles and muscles which when they test bilaterally weak such as the psoas or gluteus maximus suggest a fixation of the cervical vertebrae. I ask questions: are the muscles weak and therefore affecting the alignment, movement of the cervical vertebrae? Are one set of muscles weak or inhibited because of compensating (facilitating) muscle. Or is the opposite true? Is it the hypertonic or facilitated muscle the problem? Sometimes it’s not the bigger cervical flexor/extensor muscles that are causing pain either directly or by pulling vertebrae out of alignment and putting pressure on the nerves supplying the cervical area. 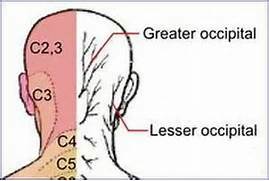 Sometimes it’s the half inch to inch muscles just below the occipital (base of your skull) that attach it to either the atlas (C1) or the axis (C2) or attach atlas to axis. These muscles are called the Rectus Capitis Posterior Major, Rectus Capitis Minor, Obliquus Capitis Superior and Obliquus Capitis Inferior. The Rectus Capitis Posterior Major extends, laterally flexs and rotates the head. The Rectus Capitis Minor extends and laterally flexes the head. The Obliquus Capitis Superior extends and laterally rotates the head. The Obliquus Capitis Inferior rotates C1 and cranium. Problems with these muscles can pull vertebrae out of alignment and put pressure on the cervical spinal roots and cause neck stiffness, pain and headaches. 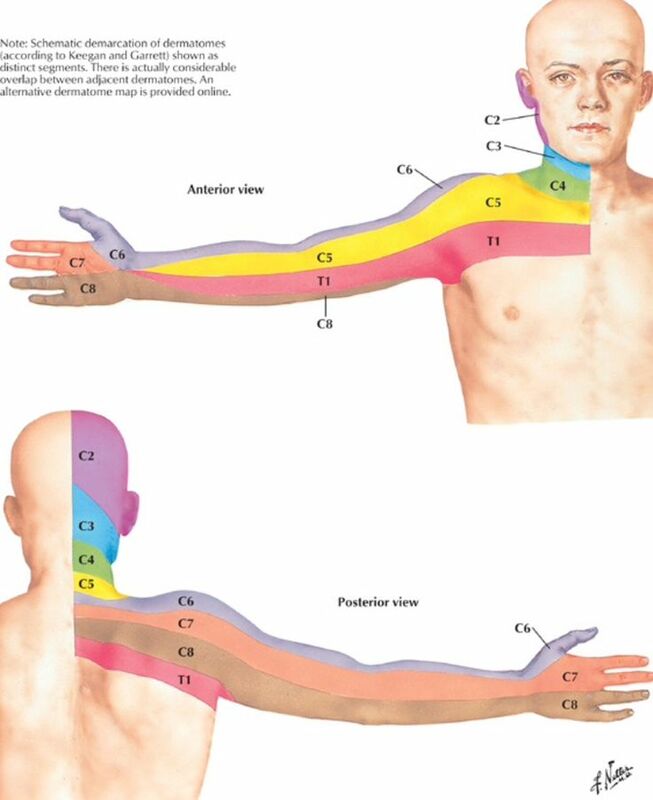 See dermatome map below for areas of innervation. Note there is no C1 dermatome. The C1 root innervates the meninges of the posterior fossa of the skull and has no cutaneous branch; the posterior fossa also contains the meningeal branches of vagus and hypoglossal nerve. Neck stiffness may be a test of the C1 root that innervates the meninges.